Three concerts on successive nights will pay tribute to the genius and versatility of Ludwig van Beethoven (1770–1827) as reflected in his chamber works. The lecture-performances will include the mighty and tragic Pathétique piano sonata, the lyrical Spring Sonata for violin and piano, and a late string quartet. Beethoven’s moving song cycle for tenor, An die ferne Geliebte, will also feature, as will the Elegischer Gesang for choir and string quartet. The choral component will be performed by the acclaimed VOX choir conducted by John Woodland. Dr Barry Smith is a South African organist, choral and orchestral conductor, author, and musicologist. He studied and completed his PhD degree at Rhodes University in Grahamstown, Eastern Cape Province. He also holds a D.Mus. from the Faculty of Music at the University of Cape Town. Smith founded the St. George’s Singers which he still directs. 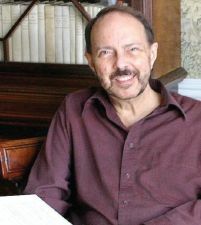 Besides conducting in the United Kingdom, Austria, and Israel, Smith has made several solo recital tours both in America and England and has played in Westminster Abbey and King's College, Cambridge. Smith was awarded the Order of Simon of Cyrene by Archbishop Desmond Tutu.